Raptor Resource Project Blog: Helping birds in winter! After one of the nicest falls I can remember, winter has finally arrived. While the eagles are more than capable of handling snow and cold, I like to help (and watch!) smaller birds like chickadees, nuthatches, finches, redpolls, pine siskins, and other visitors to my yard. Here are a few tips to make winter a little easier for the birds and more enjoyable for you! Like IHOP for birds. Looks like I need to fill the feeders again! Feed the birds! 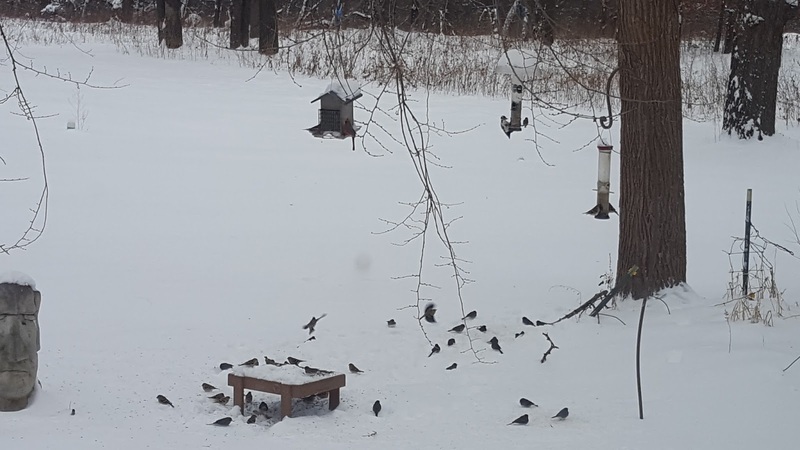 Winter is a great time to feed high-fat, high energy foods like suet and sunflower seeds. I have five feeders right now - two finch feeders (which include sunflower chips, thistle, and millet), a platform feeder with black oil sunflower seeds, a square box feeder with 'cardinal food' (black oil sunflower seeds, sunflower kernels, safflower seed, and peanuts, which also bring in blue jays and red-bellied woodpeckers), and a suet feeder. With different styles of feeder and different food choices, everyone can find something they like! Remember, it is important to feed regularly once you have started. According to the Cornell Lab of Ornithology, little birds like chickadees can lose 25% of their body weight on a cold night. If birds come to rely on you for a constant supply of food that isn't available when storms hit or the cold really starts to bite, they might not survive. Plant and landscape for birds! We are fortunate to have a lot of trees in our yard. The feeders are set up near two cedars, which provide nice, thick cover; two elms, which provide a lot of branches for perching; and an oak woodlot. We left part of the woodlot unmowed this fall, which means plenty of vegetation for perching and additional seeds for small foragers. If you can, plant native shrubs and bushes and leave some tall vegetation standing to provide cover, food, and perches for wintering birds. Install roost boxes. Another suggestion from Cornell. Roost boxes will help protect any birds that nest in boxes or cavities, including bluebirds, chickadees, titmice, nuthatches and small woodpeckers. A good roost box keeps the birds' body heat contained, has interior perches, and can be placed on a metal pole or wooden post. They are available in stores, or you can make your own. Follow this link for roost box-building instructions. Note: I haven't tried this since we have trees, brush piles, and outbuildings. But I plan to build one over Christmas break - it looks like a great idea and I would love to monitor one during cold weather! Water birds. Let's get something straight: It is not true that heated bird baths kill birds. I don't know how many times I have been told not to water birds because they will get water on their feet or feathers and freeze to perches or become encased in ice. Not true! Flowing water is a valuable commodity in winter and heated bird baths will help birds while attracting more of them to your yard. Make sure to keep them cleaned and filled if you commit to watering. Here's to a very happy and well-fed holiday to all of the birds! Looking for a holiday craft activity for children? My kids and I used to make these easy and inexpensive bird treats: http://www.education.com/activity/article/christmas-cookies-birds/. A little warning - this craft is fun, but be prepared for clean-up! Did you know? Another bonus to feeding birds - you can join Cornell's Backyard Bird Count! Learn more about it here: http://gbbc.birdcount.org/. I plan on counting birds and watching for eggs in Decorah!